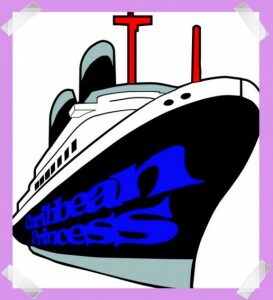 I finally found a clipart picture of a cruise ship that was easy enough to convert in order to cut out. I wanted to identify which ship we were going on, and found a really cool font called “crazy harold” to type the name in. I reduced the kerning of the text, broke the text apart, welded the body of the letters together, then combined the insert of the letters back with the body. I then used the “add perspective” tool to add depth to the words so that they would appear to be written along the side of the ship. I received high approval ratings from the husband on this one – told me that it looked “very professional”… woohoo, a compliment!! This entry was posted on Tuesday, March 30th, 2010 at 2:44 PM	and is filed under Scrapbooking and Crafts. You can follow any responses to this entry through the RSS 2.0 feed. You can leave a response, or trackback from your own site.